Help please! 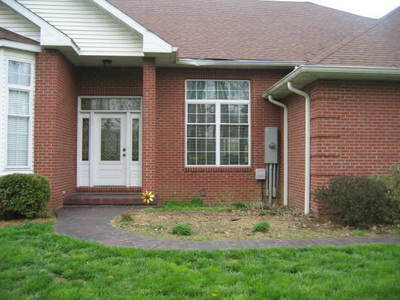 What can I plant in the front entrance of my house? It faces directly WEST. Has sun from 3:00 till sundown. Hi LinLin welcome to growsonyou this is real friendly site you ll get lots of suggestions and advice none of it legally binding and youll find that like most things theres always a different opinion. Think you need to give some idea of how you view gardening.You happy to nuture plants and tend them or do you want something low maintenance fuss free ? theres a whole range of options available it would help knowing what you do and dont like.At this point can I ask are they gas/electric meters on the wall? Before planting seriously consider a simple design perhaps circular in front and something to disguise those meters. Bonkers is right, it's hard to give advice without knowing whether you can give the time to nurture your new plants, or if this area need to be low-maintenance. However, if I were planting it up, I would want a mixture of plants including 'architectural' ones, i.e. with a definite shape such as a spiky leaved one. There are lots of those, but a couple of coloured leaved Phormiums would be a good choice. Then maybe some taller shrubs to hide the meters without blocking access. So leave a gap behind them. I would also place a trellis on the right hand wall for climbers e.g. Clematis. Also two tubs planted with bright flowers on those steps! You could change them for season e.g. Geraniums and annuals for the summer, winter pansies and training ivy for autumn and winter with bulbs underneath for spring! Suggestions for planting the rest? It looks as though you may have room for a small tree in the middle - how about a Malus floribunda which doesn't grow too tall and has wonderful pink buds opening to white at this time of year then crab apples in autumn as a bonus - or a Hibiscus syriacus, a beautiful but slow-growing small tree/large shrub. You could plant Hebes which are evergreen and flower for a long time,but not the dwarf kind. Cistus would do well, they are also evergreen, like the sun and have lovely bright flowers in summer. I would underplant with small spring bulbs (snowdrops, crocuses, Scillas, Chionodoxa) to welcome you to the door, along with ground cover plants like Lamium, hardy Geraniums or golden Thyme (attracts Butterflies). None of these need lots of maintenance except weeding! If you decide on perennials rather than the above, please ask and I'm sure we can give you a lengthy list! Hope this gives you food for thought. There are so many alternatives! They are cable and electric meters. Our house is so far from the road that this was the only place available for the meters. You can't see them from the road, but when you come to the door, there they are. I work from home. I love to work in the garden. This area does not get a lot of sun. I live in Illinois. Summers get hot. Thanks for any advice. Along the front we have boxwoods, hollys, and junipers. For this area, not sure what to do. I think we'll have to start again, as I didn't realise where you are... I am afraid that my last ideas might not work in view of your further information. Is the soil very dry normally? I reckon you could still go with some 'Architectural' plants and also put up the trellis for the r-hand wall. When I wanted some ideas for 'Architectural' plants recently, I googled them and found good sites for ideas to plan the area. Then, why not visit your nearest Garden Centre or Nursery and see what they've got? The staff normally have good plant knowledge - well, they do here, anyway! Sorry Linlin your blog didnt say you live in US so not sure we in UK can advise directly on plants.We dont have much experience of planting for sunny spots as we never get any sun! Joking aside agree with Spritz some trellis on right side in line with garage? would screen off meters from view .more trellis to left of window a circular area in front of sunflower perhaps a bench between trellis and meters. You then have a basic design to work around rather than buying plants first and trying to make them fit - which we ve all done at some stage. i would go for partial shade loving - maybe hostas? « Can anyone tell me the name of this little plant for me?